On the 30th January, the UKITF held its annual Training Day and Awards Night. Led by Grand Master Nicholls and supporting Masters, this was a great opportunity for students to meet and train along-side their Taekwon-Do family whilst soaking up the guidance and support of the senior instructors. After a quick introduction from Master Nicholls we were ready to begin…With an emphasis on foot work and co-ordination the warm up quickly turned into an intense work out as we kicked and punched our way up and down the training room. Finishing the morning session with a variety of fun yet energy zapping fitness drills, we were then able to relax whilst the 5 Masters in attendance showcased a display of their talent and experience. With flexibility, tul, self-defence and power demonstrations on show, this was a true spectacle not to be missed. After a short lunch break we were instructed to split into groups and attend an afternoon of workshops focusing on sparring, patterns and self-defence. Students were able to work their way through each station and receive a short Master Class from the Masters present. As the training day came to its conclusion we were treated to some encouraging words of wisdom from Grand Master Nicholls before retiring to our rooms to relax and dress up for the evenings banquet. Boasting over 180 in attendance, it was encouraging to watch as people arrived dressed in their finest dinner wear, enjoying a drink and relaxing amongst friends. This truly shows how well supported the UKITF has now become. After dinner it was time for the awards………. We would like to sends our thanks and appreciation to the UKITF executive committee for hosting such a wonderful day, Master Nicholls for his continual involvement and guidance and of course to all the members that supported the day, whom without the event would not have been the success it was. 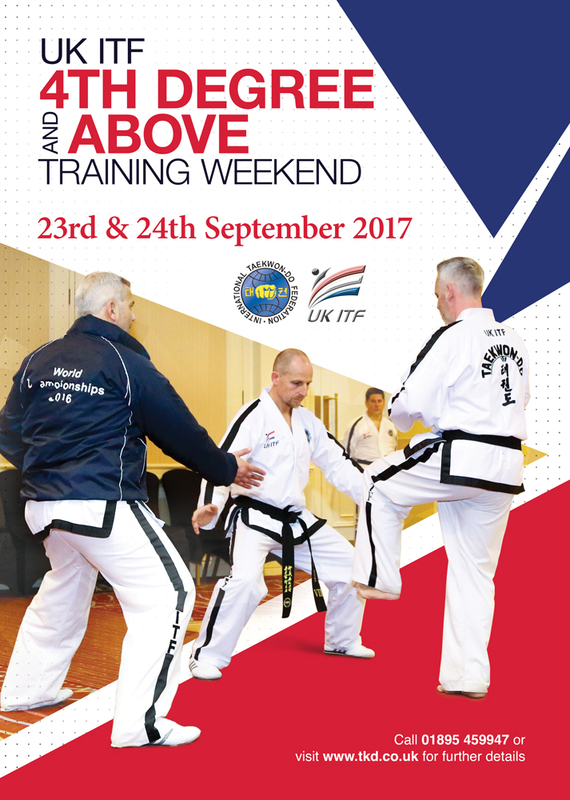 We look forward to seeing all our Taekwon-Do friends at the next upcoming event.